Aloe vera pups growing on the stem. My aloe vera has been producing pups but I have been removing them once they get to about 3". But now it's been growing pups half way up the stem. Is this normal? Could I remove them too. I just want one aloe vera plant, not a bunch on one pot. Yes, this will be normal. 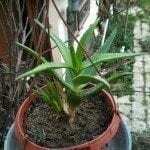 Most aloe will not grow as a single plant, and will crowd its self. They tend to grow better like this.